However, with a pleasant access road leading to the transmission mast on the ‘summit’ Corn Hill is a fine locale for a family outing, taking only 15 minutes or so each way. Having said that, I’m not sure it would be worth a specific journey if you weren’t on a mission. 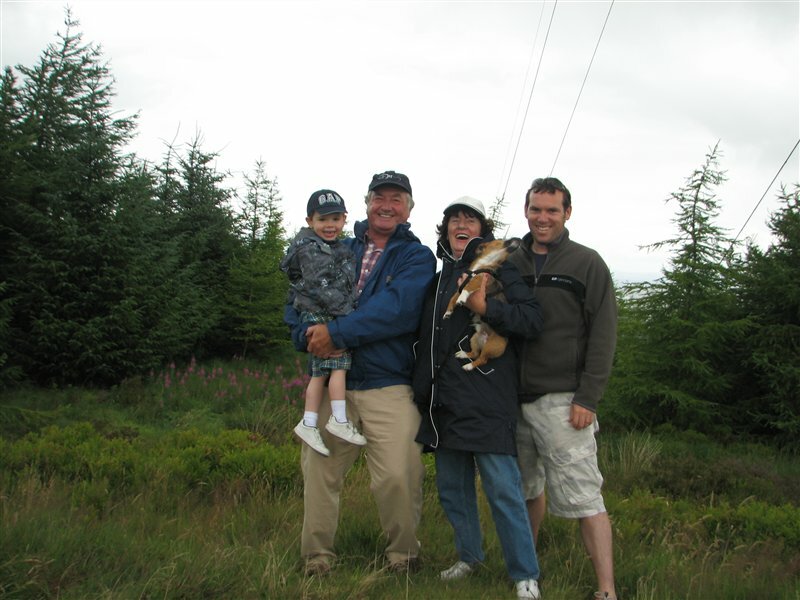 I had the pleasure of walking up Corn Hill (aka Cairn Hill) with my parents and my son. 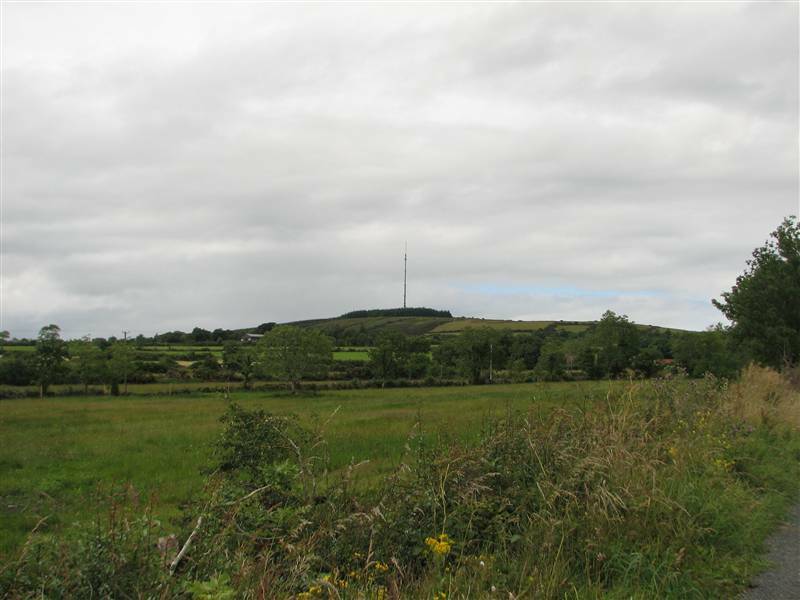 After a pleasant drive from Edgeworthstown spent enjoying the lush summer fields and spotting Celtic Tiger houses, the mast on Corn Hill comes into view a couple of miles out. We parked up outside the access road gates and from there it’s a simple walk up the grassy track to the summit, which is just past the mast. Unfortunately the views in many directions are hidden by trees and with my parents around I didn’t dare urge my three-year old to shimmy up the mast in order to see more. In spite of its low elevation, Corn Hill does have decent views particularly to the south. 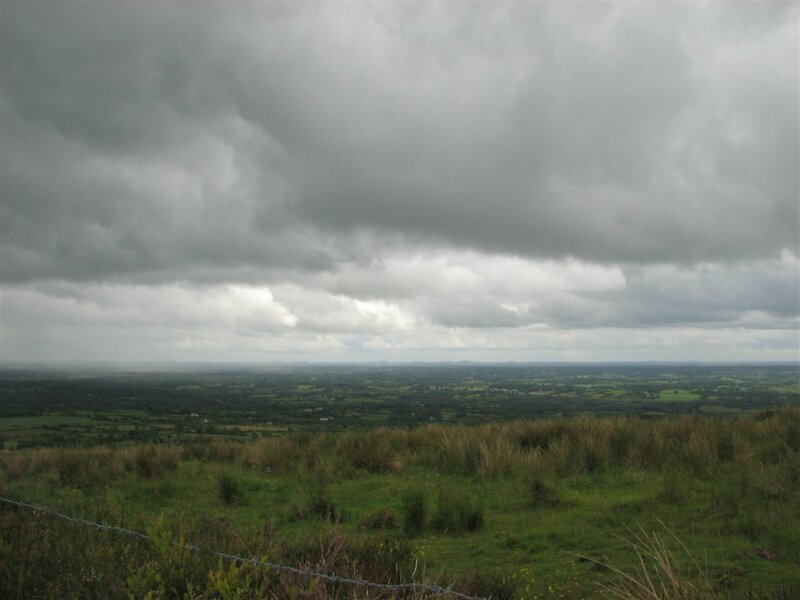 Every time I go up the hills I tell myself I need to bring an overview map of Ireland so that I can identify mountains in the distance. Corn Hill was the last of the easy walks for this challenge and I have now reached the top of all the mountains that are close to Dublin and relatively simple to ascend. All of the remaining mountains are mountains, such as Slieve Donard, Galtymore and Mweelrae. I look forward to tackling them. I didn’t buy map sheet 34 for this walk as this is probably the shortest and easiest County Top to reach. To reach Corn Hill we drove to Edgeworthstown and followed signs for Derrynacross. In reality though, we used GPS navigation as there are plenty of turns involved in the journey. We had lunch in a cafe called ‘Bia Deas’ in Edgeworthstown. They serve coffee in teapots and heinz tomato soup as soup, in a room furnished with brightly coloured fake flowers. No michelin star as of yet.